The competitors paddock at the Geelong Speed Trials commemorates F.S.T. 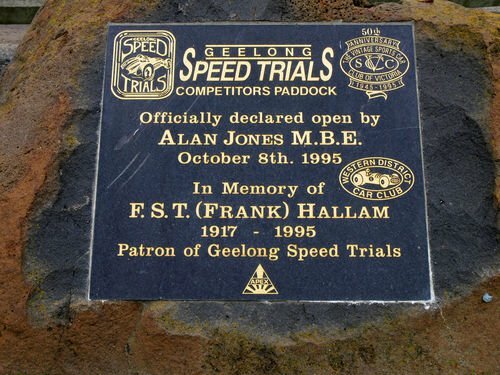 (Frank) Hallam who was the patron of the Geelong Speed Trials. The original speed trials began in 1956 and were staged continuously until 2003. Among the famous drivers who competed were Sir Jack Brabham, Sir Stirling Moss, Bob Jane and Mika Hakkinen. The 1980 Formula One champion Australian Alan Jones made his race debut at the Geelong trials in 1964. The Speed Trials were modelled on the famous Brighton Speed Trials in the United Kingdom. These originated in 1907. The venue and picnic atmosphere of the Trials has been an attraction in itself. The course takes in the Edwardian setting surrounding Ritchie Boulevard (Geelong's roadway access to Eastern Beach) and part of Eastern Beach Road. The trials were revived in 2012 and are kown as Just Cars Geelong Revival.